The Detroit Red Wings have been on a roll of late, and the hot streak continued on Friday night. Shutting out the New Jersey Devils, they earned their fourth win in a row. Although this may seem counter-productive to obtaining a high draft pick, the team is gaining confidence before their off-season begins. Jonathan Bernier pitched the shutout through the first two periods before an upper-body injury forced him to leave the game. Jimmy Howard relieved him for the final 20 minutes. 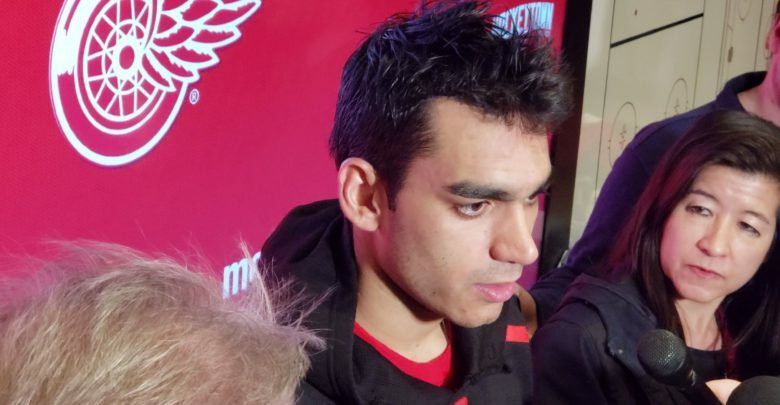 The story of the night was Andreas Athanasiou, who scored his 30th goal of the season. It came late, after Tyler Bertuzzi scored an empty-netter to make it 3-0. Double-A cut through two Devils D-men in the slot and scored high on Mackenzie Blackwood. He is Detroit’s fastest, highest-skilled player, and reaching this plateau was a great feat for him. The previous night, Dylan Larkin reached the 30-goal mark as well, scoring two goals against the Buffalo Sabres. Having not one, but two players hit this milestone is a strong sign for the future of this Red Wings team. is primed to lead this team for years to come. Danny DeKeyser and Dylan Larkin (31st goal) also scored in the game. DeKeyser’s goal was a redirection past Blackwood. Larkin and Bertuzzi assisted. Detroit’s first period was very strong, and they greatly outshot New Jersey. Larkin’s goal came two minutes into the middle frame, also assisted by Bertuzzi (Mantha had the secondary assist). This was Bert’s second straight three-point night. Recent signing Taro Hirose did not register a point in the game, but his previous five consecutive games with an assist were one shy of Wayne Gretzky’s six and two shy of Sergei Markarov’s seven. He was solid again in his 13:49 of allotted ice time. Detroit has a bit of a goalie dilemma, with Bernier and Griffins netminder Harri Sateri (broken finger) out. Detroit has reassigned Kaden Fulcher from the Toledo Walleye (ECHL) to the Griffins. No goalie call-up has occurred as of yet, with Howard still scheduled to make his start on Sunday. Detroit moved to 70 points on the year with four games remaining in the season. New Jersey (67), Los Angeles (65), and Ottawa (60) are the bottom three. Ottawa’s potential first overall pick belongs to the Colorado Avalanche from the Matt Duchene trade. The Avs hold the second wildcard spot in the Western Conference, meaning they can win the Jack Hughes sweepstakes and still make a good playoff run. Meanwhile, the Grand Rapids Griffins sit second in the Central Division with 86 points behind the Chicago Wolves (90 points) with two weeks left in the season. Once the Wings finish their season soon, their borrowed players will be returned, further bolstering an already strong roster.